FND Truck Division in Action. The pit lane drag strip roared to life Friday night as drivers converged on Atlanta Motor Speedway to open the 12th season the ever-popular O'Reilly Auto Parts Friday Night Drags and Show-N-Shine. Eighteen racing divisions went head-to-head in one of the largest organized street-style drag racing series in the nation, with single-elimination competition determining each winner. Vehicles ranging from souped-up muscle cars all the way down to factory cars and daily drivers participated in the first of two non-points night leading up to the June 1 regular points opener. "It is good clean fun," exclaimed Ed Blanford of McDonough and that keeps him coming out to Friday Night Drags each year. "I'm from just down the road and have a lot of family and friends that come out each week." Blanford and his best buddy, James Ragsdale of Hampton, have competed regularly over the years in the Starfire Automotive Gates Truck division and were finally able to pit their Fords against one another in the final. 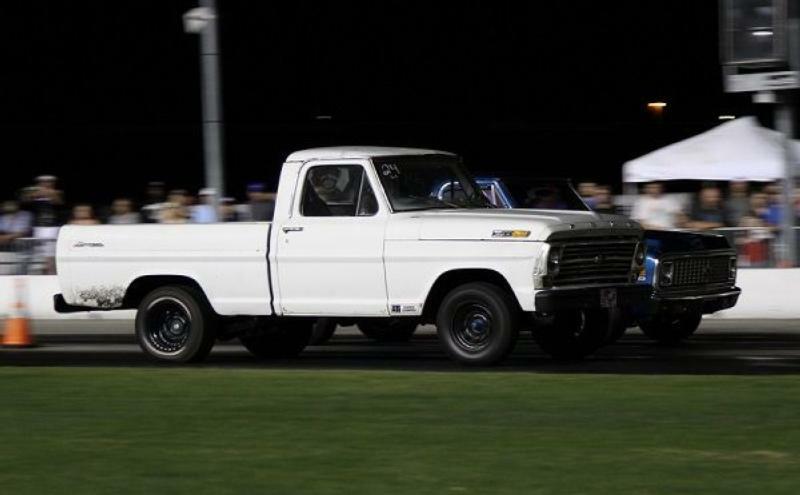 "We've been waiting for the Ford on Ford - It's always been a Chevy in the finals," said Blanford as his 1968 Ford F-100 exploded off the line and outpaced Ragsdale's 1978 Ford F100 for the final round win. "I just hooked up really good and left pretty clean," replied Blanford when asked about the key to his final round win. In the Harding Plumbing, Heating and Cooling Domestic Division, Donnie Henderson and his 1980 Chevrolet Malibu outpaced the 1989 Ford Mustang of Raymond Puryer to earn a trip to victory lane. David Waksman of Sharpsburg took home the hardware in the Summit Racing Equipment Sportsman division with a final round victory over Senoia's Chase Ponder. The first race of the year in the Harbin's Mechanical Services Street Outlaw division went to Ross Cole of Sharpsburg behind the wheel of a 1972 Chevrolet Camaro. Atlanta Motor Speedway's O'Reilly Auto Parts Friday Night Drags & Show-N-Shine continues with week 2 action on the pit lane drag next Friday, May 18. Grandstand gates open at 6:30 p.m., and nightly drag race eliminations start just after 9:00 p.m.